Note: this is work in progress, there are still unexplained anomalies that do not conform neatly to the explanation suggested below ie “early pressings” with high stamper numbers. It works much of the time but we still don’t know enough. 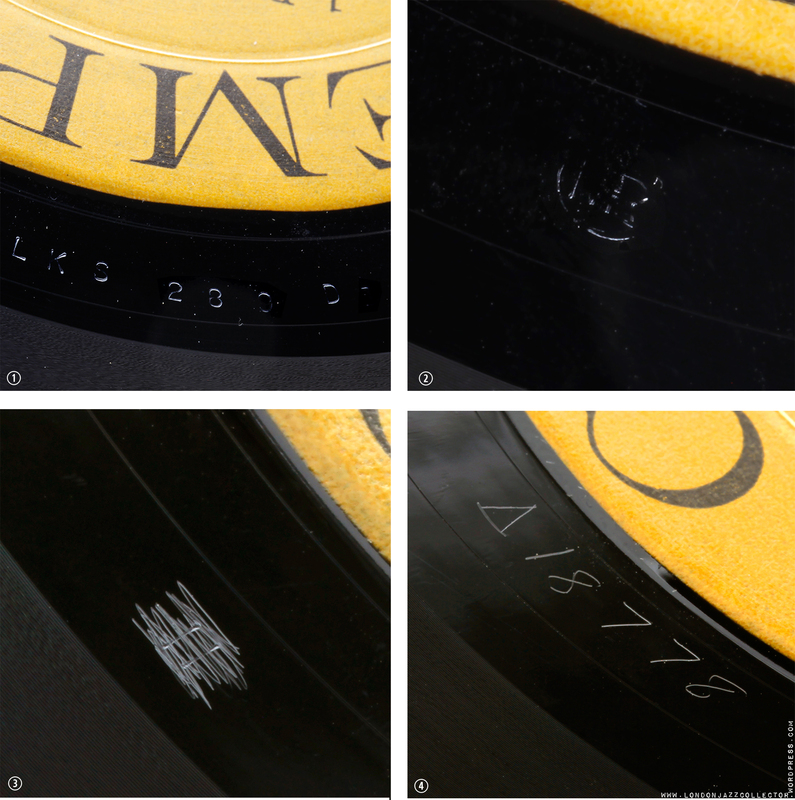 Each record pressing derived from an authentic Lester Koenig master has the matrix code LKL (mono) or LKS (stereo) stamped in the run-out, followed by its matrix number – from 10 to the mid 300’s, e.g. LKS 312. Briefly after the transition from 10″ to 12″ records, the matrix code also includes a 12 prefix to distinguish it from the 10″ master e.g. LKL 12 15. This is followed by D and a number, which suggests where in the pressing timeline your copy falls, starting with a mother/stamper code D1 – the first mother/stamper set – to later mother/stamper derivations which can run as high as D9. 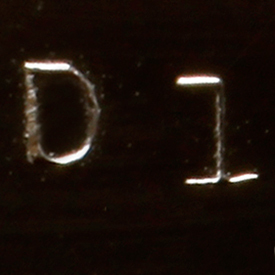 Taken with other detail like cover addresses, groove type and vinyl weight, it seems likely the metalware derivations from the master acetate were sequential, starting with stampers from mother D1, moving on to stampers from mother D2, then D3 on up to higher D values, as earlier mother/stamper sets became worn out. This seems likely since most pressing was done at the one same RCA Hollywood plant over a twenty year period, the master archived there, and further mothers generated according to demand for the title. Anomalies do occur, such as a record which appear original 1st pressing – but with higher stamper codes D8 and D9. Such cases are the exception, and it looks like “leapfrogging” the mother count, as it is highly improbable that the record in question uniquely went through seven previous mothers to arrive at D8. If you have not already done so, I recommend you document the stamper codes of your Contemporary pressings, so at least you know what you have. I annotate the plain paper replacement inner sleeve with detail like this for ease of reference, along with listening observations, on the lines of wine-tasting notes. It is always useful to jot these things down at the time, and not rely on your trying to remember what you thought of something several years later. 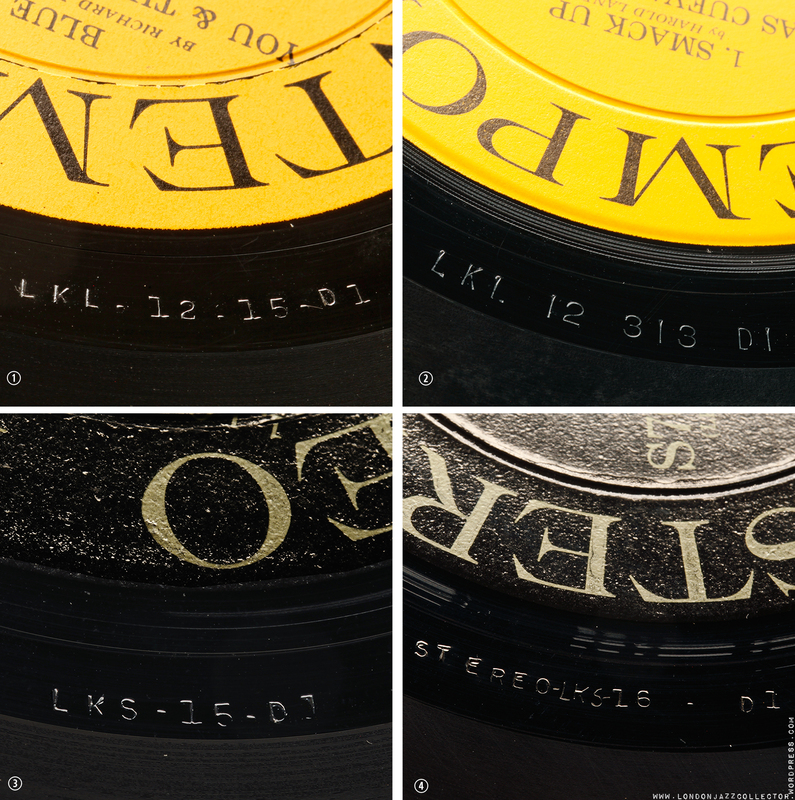 The four pictured are D1 stamper codes, which are consistent with first original pressings taken with all the other detail. Example 1 is early C3500 series while example 2 is the far end of the M3500 mono series. 3 is early S7500 Contemporary Stereo while the final example 4. is from the 1958 Stereo Records S7000 series, the matrix including the STEREO reference. 1,3,and 4 are embossed matrix code, 2 is drilled matrix code. The next three stamper codes illustrate much later D-codes associated with reissues manufactured much later in the ’60s and ’70s, even early ’80s. (Caution is required as there are a few infrequent anomalies which require different explanation). Example 1 S7549 is a second issue dated after 1963 (cover address 90069) of a record first released in 1958 on black/ gold label. It is characteristic of green labels that they are accompanied by a D2 or in this D3 . Example 2 S7556 is simply a first half of the ’70s reissue 96 gram vinyl weight, no groove, but an RCA Hollywood pressing H.
Example 3 and 4 are of the same record, S7532, the stereo edition of the very beautiful Art Pepper Meets The Rhythm Section, a record which I guess sold well. LKS stamper origin of pressing, 112gram vinyl, neither RCA nor Monarch markings, and P.O. Box 2826 address places it anywhere between 1979 – 84. Showing a sense of humour with the green print and frame, but otherwise, it at least has lineage to LKS master, sixth in line to the throne. Simply run a finger tip over the surface and you will instantly notice the difference, the embossed is proud of the surface. The fonts generated by the two methods are quite different – the drilled font is condensed, large and tall, and the number 1 is a simple vertical stroke. The raised embossed font is small, letters of equal height and width and the number 1 has a prominent base serif and left bar on top. Could there be two separate sources of metalwork? There doesn’t seem any correlation but the sample size is too small to have any confident insight into what it might tell us about two different metalware stamping technologies. The embossed stamp seems associated with RCA Hollywood (“H”) pressings which include second a later pressings. The large drilled matrix is more closely associated with older original pressings with black labels and D1 codes. More research required (sigh). In the chronology of stamper codes, you find original C3500 deep groove yellow labels and the S7500 black label gold print stereo label associated with D1 stampers. The marbled green labels gold print turn up most often with D2 or D3 stampers or later, almost never D1. The thin grooveless yellow label ’70s reissues in my collection are most often D5, D8, D9. The recording session may be 1956, the cover and liner notes may say ©1957, but a stamper code tells a quite different story, especially with a cover address zip code 90069 (after 1963). 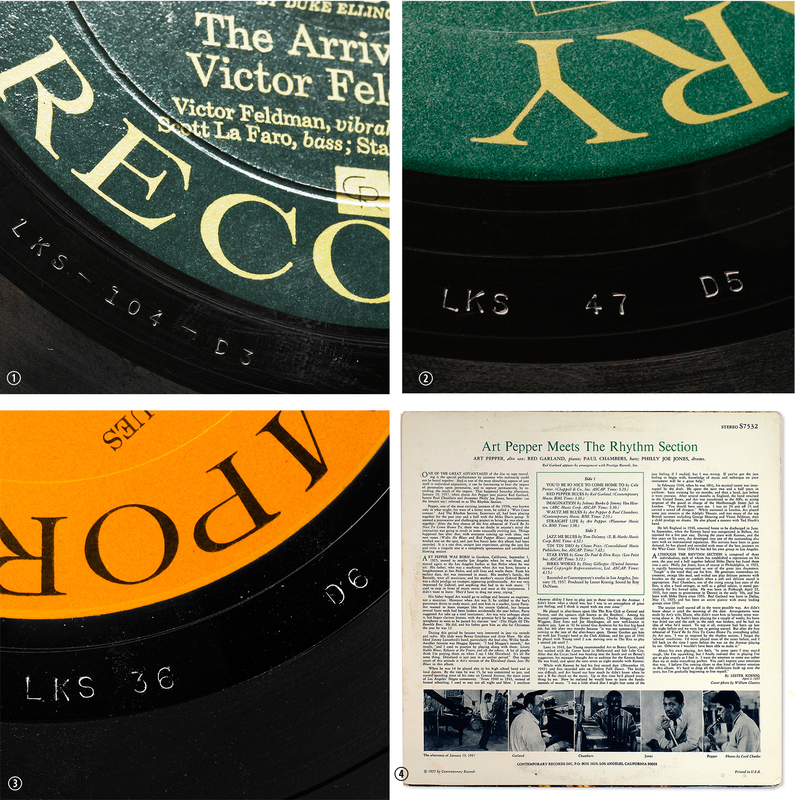 Most Contemporary records were pressed at the RCA Hollywood plant, indicated by stamped letter “H” in the run-out. The stamp is found on both early ’50s pressings through to the early ’70s – even light weight reissues with no deep groove and high value stamper codes. Not every Contemporary record was pressed at RCA – a small proportion have no H stamp, and were pressed elsewhere. The RCA Hollywood plant closed in 1976, the H stamp ceased, and the role of pressing Contemporary reissues went to Monarch Record Mfg L.A. Records I initially thought were digital clones (some of which do exist) are in fact official Contemporary Monarch reissues, manufactured during John Koenig’s period as Head of Contemporary. As collectors are more likely to encounter these Monarch reissues (and OJC) than originals, it is worth taking a moment to identify Monarch pressings. Monarch were the main West Coast plant that developed styrene injection moulding for 45 rpm singles, but fortunately this didn’t extend to Contemporary LPs. What they did have was access to authentic Contemporary metalware, LKS stampers, most likely taken from the closing RCA Hollywood plant. These were given a Monarch make-over, illustrated by this late ‘ 70s Monarch reissue of S7620 Elmo Hope Trio. 3. The RCA Hollywood H symbol is vigorously scratched out, on both sides. 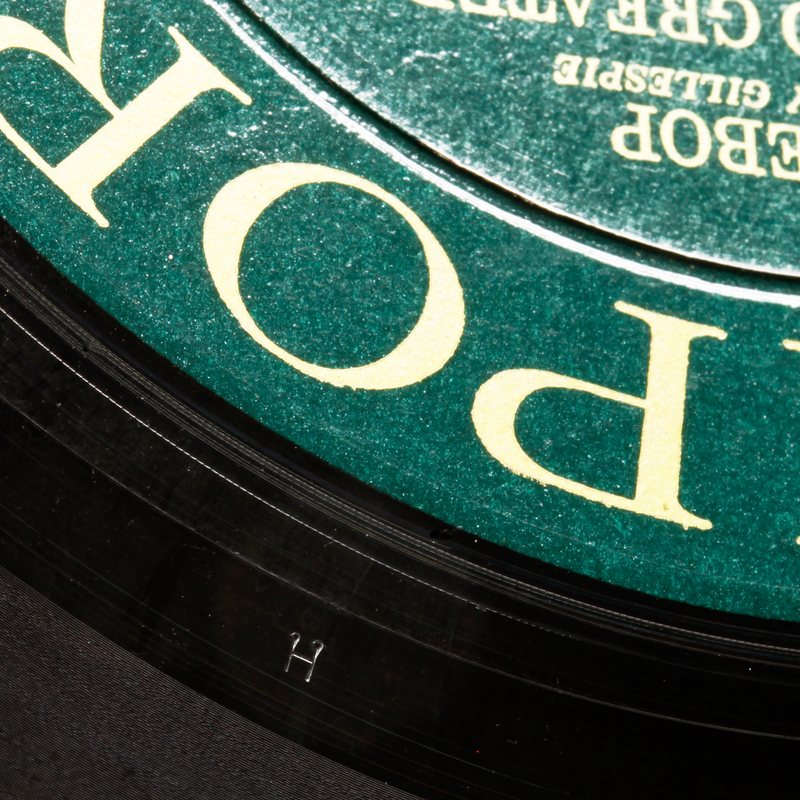 Its presence confirms that RCA Hollywood was responsible for all aspects of metal ware production, and the H is embossed on the stamper itself, unlike the Plastylite ear, which was applied to the record in the factory only at the time of pressing. 4. Monarch’s identifier for pressing plant workflow control is the Greek letter delta (or for those without the benefit of a classical education, triangle) followed by a sequential job number – which increments by one for each pressing job. Here, job delta 18778 is the Elmo Hope Trio reissue, and side 2 bears the same job number with an added -X letter. Monarch reissues can be dated yet more finely through the cover address, which for at least its first two years of tenure 1976-8 remains zip-code California 90069. Around 1979-80, to judge from the covers of Contemporary few new releases, the Contemporary address changes to P.O.Box 2628, California 90028, which it remains until the sale of the company in 1984. (This is particularly painful as it finally extinguishes all hope for four of my Contemporary issues being in any way original or even vintage). In the final years of Contemporary, John Koenig introduced a new release series, 14000, with recordings of a jazz fusion bent, along side a further wave of reissues from the S7500 catalogue. New recordings were simply mastered for or by Monarch themselves, and the run-out stamps are hand-etched. Some reissues were also re-mastered and lost continuity with LKS stampers. Very faint, the Monarch job code delta 571, LKS 361 D2 mother plus unknown code 4 perhaps stamper pair 4, and free-standing stamp SLM (not SLM delta), Sheffield Labs Matrix, an L.A. matrix-to-mother processing operation, vinyl weight 108gm. Average weight of those with deep groove: 141gm, those without deep groove: 117gm. Cover Address gives best correlation with vinyl weight and age. We know from the large sample of 1500 ’50s ’60s records that vinyl weight correlated well with age, as record pressing practices changed. D codes, pressing volumes and timeframes. Every title commenced release with D1. The potential maximum volume per mother may in practice not have been reached. Possible a major repressing exercise five years after release would have resulted in a fresh mother being generated eg initial release 1958 Black label D1, first reissue 1963 Green label D2, second reissue yellow label 1970 D3, and so on. Just guesswork. From a collector standpoint, first original D1 is closest to the original recording and the most desirable. Two decades later a lightweight vinyl pressing from a D6 stamper may still sound good, but the market and collector-lust for “originals” decides what that is worth. Something rare, desirable and authentically original is worth a lot more, though last pressing off an early worn stamper may not sound as good as an early pressing from a later stamper. It is all part of the fun of collecting, and the business of selling.